Cleveland Cavaliers center Andrew Bynum (21) tries to get around Milwaukee Bucks center Zaza Pachulia (27) in the 2nd quarter at BMO Harris Bradley Center. CLEVELAND — Andrew Bynum may have played his last game as the center of the Cleveland Cavaliers, and possibly his last game in the NBA. Bynum was suspended by the Cavs for conduct detrimental to the team. The announcement was made Saturday morning. Multiple league sources have told FOX Sports Ohio the Cavs are trying to trade Bynum. One described that possibility as challenging, but possible. Yet another source said opposing teams are not interested in a trade and predicted the Cavs will waive Bynum within the next 10 days. 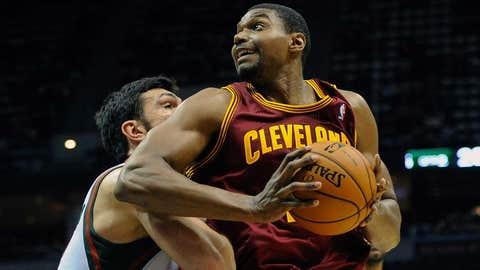 Bynum signed a two-year contract with the Cavs over the summer. It is worth up to $24 million over two seasons, provided he reaches several benchmarks. However, only $6.6 million is due if Bynum is waived before Jan. 7. While Bynum the center may no longer be viewed as an asset to opposing teams, his contract almost certainly is, sources said. The Cavs, 10-18 entering Saturday’s game at Boston, have struggled with or without the 7-footer on the floor. Both the team and Bynum have labored in getting him good looks at the basket and failed in repeated attempts to run the offense through him. He played 17 minutes in Thursday’s double-overtime loss to Atlanta and took just three shots. The game before that, he went 0-of-11 from the field in a loss to Detroit. About Bynum suspension, league source tells Yahoo: "He doesn't want to play basketball anymore. He never liked it that much in first place." Cavs coach Mike Brown didn’t drop any hints about Bynum’s suspension prior to Saturday’s game. "That’s an internal matter," he told reporters in Boston. "I know you can respect that, so there’s really nothing to tell." As for the length of the suspension, Brown said, "It’s indefinite. I’m not trying to be funny, but everyone knows what indefinite means." Bynum, 26, was signed in the off-season after missing all of last year with the Philadelphia 76ers with knee issues. He underwent surgery on both knees in March, and hinted at retirement prior to the Cavs’ game in Philadelphia on Nov. 8. "Retirement was a thought, it was a serious thought. It still is," Bynum said. "It’s tough to enjoy the game because of how limited I am physically. I’m working through that. Every now and again I do (think about retirement). …It’s still career-threatening. I’m a shell of myself on the court right now. I’m just struggling mentally." He is currently averaging 8.4 points and 5.3 rebounds per game. After resting on back-to-back games earlier this season, he had played in 18 straight until Saturday. "We’ve got 14 guys in that locker room that are very focused and determined and ready to take on any challenge that’s in front of them," Brown said. "They’re great guys. They’re focused guys, and they know how to play the game the right way. That’s what I’m focused on, just helping those guys win ball games."